As a car, truck, or motorcycle owner in Virginia, getting a VA vehicle safety inspection each year not only ensures proper maintenance and makes driving safer for you and others, it is also required by law. As a consignment store for cars, CarLotz sells thousands of sale-by-owner vehicles each year that all pass a VA state safety inspection, so we thought it would be helpful to provide car owners answers to some frequently asked questions that will provide a better understanding of the process. What is a VA Vehicle Safety Inspection? 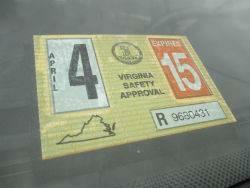 Motor vehicles registered in Virginia are required by law to pass a vehicle safety inspection annually. 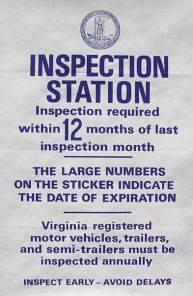 When a vehicle passes a VA state safety inspection, the inspection station will place a safety inspection sticker on the windshield showing month and year in which the inspection will expire. The inspection expires on the last day of the month printed on the sticker. What Does a VA Vehicle Safety Inspection Cover? The Commonwealth of Virginia requires state safety inspections annually to ensure that cars driven on its roads meet certain safety standards, a precaution that reduces accidents and related injuries. Certain municipalities within Virginia may also require an inspection of your vehicle’s emissions system. A full list of the Virginia Motor Vehicle Safety Inspection Rules and Regulations may be found in Chapter 70 of the Virginia Administrative Code. Where Can I Get a VA State Safety Inspection? How Much Does a VA state safety inspection cost? The following list of vehicle safety inspection fees are maximums mandated by Virginia law: $16.00 for cars and trucks, $12.00 for motorcycles, and $51.00 for tractor trailers. Certain dealerships and repair shops offer free or discounted VA state safety inspections for promotional and customer service purposes. If your vehicle fails inspection, you will be responsible for the cost of any required repairs. What Happens if My Vehicle Fails a VA Vehicle Safety Inspection? If your car does not pass its annual VA state safety inspection, and you fail to make the required repairs, the inspector will place a rejection sticker on your front windshield that is valid for fifteen (15) days. You must have the necessary repairs completed and have your vehicle re-inspected within that time frame. If your vehicle fails inspection, you may take it to another inspection station, but the new station must conduct a complete safety inspection (and charge you the associated fee), not simply an inspection of the failed parts. Owners that drive their vehicles with an expired or failed VA state safety inspection sticker may be pulled over by the police and ticketed, which could lead to a fine and be posted to your driving record. Do Antique Vehicles Need to Pass a VA Vehicle Safety Inspection? For a vehicle to qualify as an “antique” in Virginia, it must be 25 years old or older. If the vehicle is registered as an antique through the Department of Motor Vehicles, it is exempt from VA state safety inspection requirements. As a result of the less stringent safety requirements, however, the DMV places certain use restrictions on vehicles registered as antiques. For example, a vehicle with antique plates is restricted from being used as your daily driver. 0 comment(s) so far on What is a Virginia Vehicle Safety Inspection?